Dining at Ulusaba is one of the best parts of your stay, whether you choose to dine out on the deck watching the African sunset or in the dining room, our chefs have to work hard to compete with the specular views of the bush below to ensure that our delicious dishes are equally as Instagram-worthy! 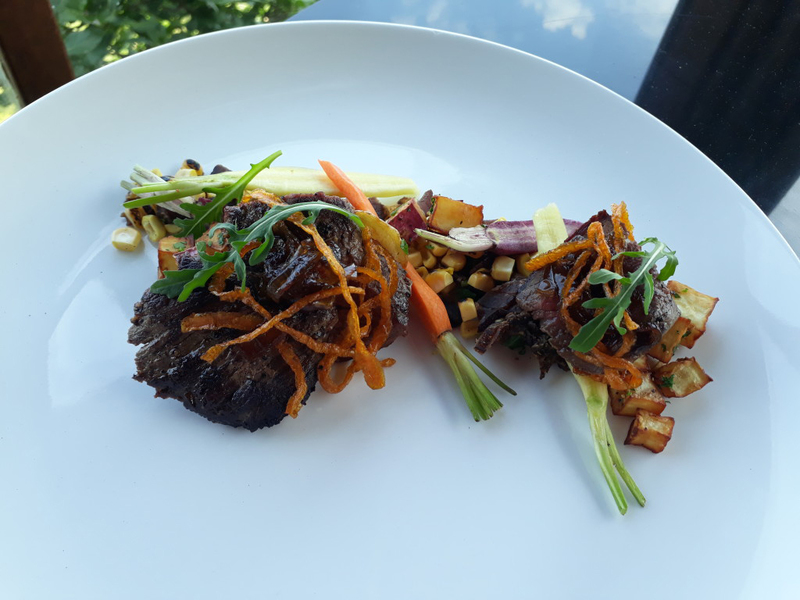 Safari Lodge Chef, Connie, has shared her tasty (and beautiful) recipe for Ostrich and biltong. Not only is it delicious, it's also a sustainable dish, using local South African ingredients and whole, organic vegetables to reduce food waste. Mix the corn, parsley and biltong together, and set aside. Deep-fry the carrot peel. Put aside. Cook the sliced onions in a sauce pan until soft, add the balsamic and sugar and cook down to a marmalade. Put aside. Pan sear the ostrich and place in the oven for about 5-7min for a medium or medium rare. Rest the ostrich for 5 min, and slice as preferred. Plate the dish and dress with wild rocket. Season as preferred.